[General Description] This Classic Renaissance style building has bay windows extending for 4 stories topped with a balcony and a cantilever awning over the footpath, one of the first of its kind in Adelaide. Architect was P.R Claridge, contractor M.C. Richardson of Medindie, the cost approximately 45,000.00 pounds. The bay windows section is best viewed from this lane opposite. [On back of photograph] 'Looking towards Gawler Place, east side, from the western end of Featherstone Place showing Claridge House / 29 April 1928 / Claridge House erected in 1926-7. 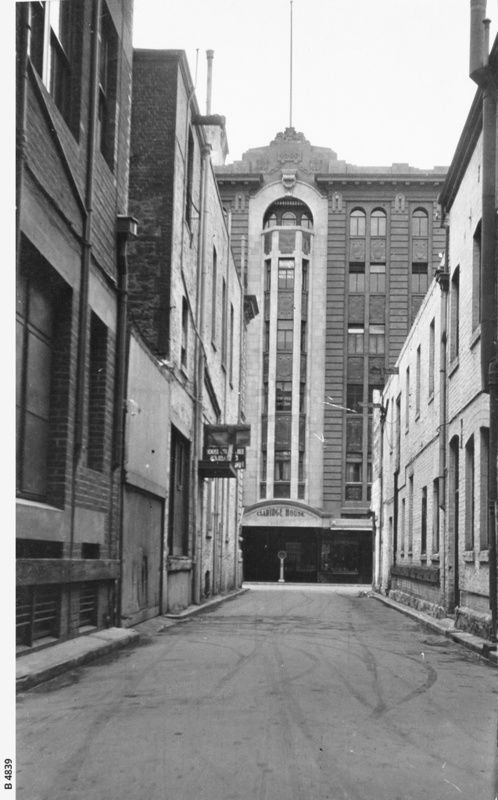 (For other views see B 4712 and B 4840) / For other buildings previously on the site see B 3319 / Site of Claridge House: north side is 33 yards south of Rundle Street. / Frontage : 20 1/2 yards'.